There is a colony of Seals that are resident at Godrevy, about 30 of them stay all all year round. There are about 30 more that visit quite regularly and an estimated 200 other seals that visit during the year, its not surprising that we see them quite often and those who walk the rocks and cliffs past the island can see the regulars on most days. Viewing at low tide from above the car park on Godrevy head is possible and small binoculars will help to study them as individuals. Less is known about the Dolphin population that can be seen playing in the bay, often in groups of 6 or 8. These magnificent creatures are thought to be simply passing groups. 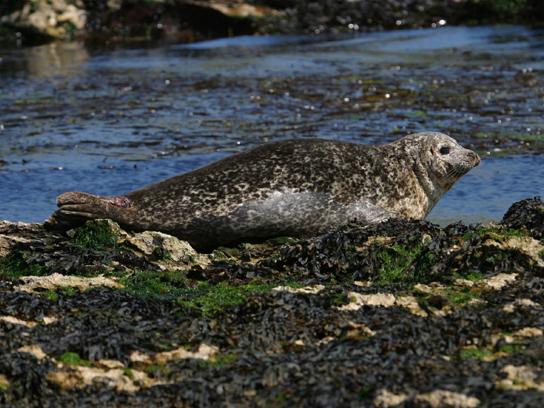 For information on the local Marine Mammal emergency services and the very active Cornwall seal Group visit there website by clicking the link below.